PortalMapBot is a Telegram bot that lets you search for portals in Niantic’s augmented reality game Ingress. Intel links can be used to find portals more specifically than title alone. This is especially handy for portals with generic names. Intel links also work in groups that the bot has been added to. This format is mainly useful for use in IITC plugins and other tools to reference a specific portal. All portals in Ingress have a unique identifier known as a guid or uuid. Note the PortalFinder plugin includes a handy button to copy @PortalMapBot guid for fast inline searching. Note extra characters before or after the guid are generally ignored. Setting your home location prioritises results from near your home location first. By default the radius is 100km, but this is configurable. You can set or clear your home location and radius with the /settings command. You can either send your current location with the popup keyboard button, or you can manually send a location. 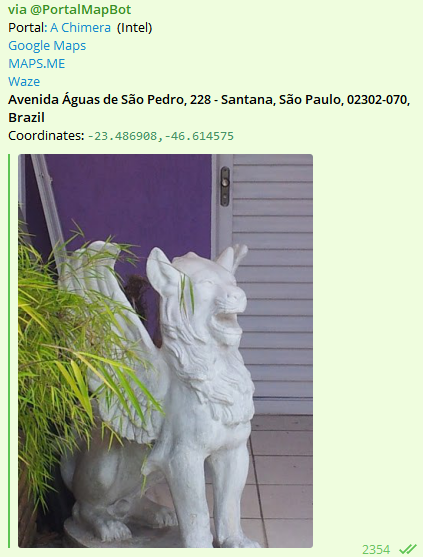 Telegram Desktop does not support natively sending locations, a workaround is to tap the set location message and select reply, then send a portal with PortalMapBot inline mode. PortalMapBot has always relied on crowd sourced data for its portal database, but now with Operation Portal Recon in full swing and portal submissions reopened it’s time to expand the userbase. PortalFinder is a userscript that can be used in Tampermonkey or IITCm to help find new portals for PortalMapBot. Note portals are not added immediately to allow for verification to ensure the integrity of the database. PortalFinder is a 100% passive plugin that never makes its own requests to Niantic servers, instead it passively looks out for new portals during your regular day to day use of the Intel map (either vanilla or IITC), the Ingress Mission Creator Tool, and Operation Portal Recon. Note if you are already using IITC you likely already have Tampermonkey installed and can skip step 1. If using IITCm, download the userscript and add to IITCm from the IITCm settings window. 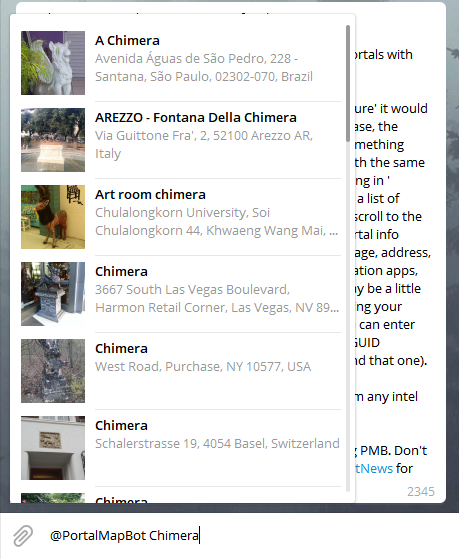 If you are using IITC, PortalFinder will also add a TG Link button in the portal info sidebar that will copy a PortalMapBot inline search to your clipboard that can be pasted into Telegram to quickly share a portal. If you have a good suggestion you would like to see implemented in PortalMapBot, use the /suggestion add this cool feature command in a private message with the bot. If your feature is implemented and you would like to be credited for the suggestion, please say so in your message. Otherwise we will assume you wish to remain anonymous.